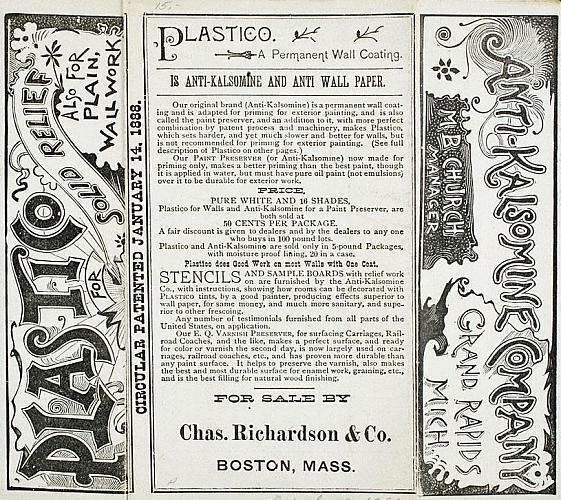 The circular for Plastico, a permanent wall coating, "for Solid Relief, also for Plain Wallwork" is a product of the Anti-Kalsomine Company of Grand Rapids, Mich. M(elvin) B. Church is listed as manager. 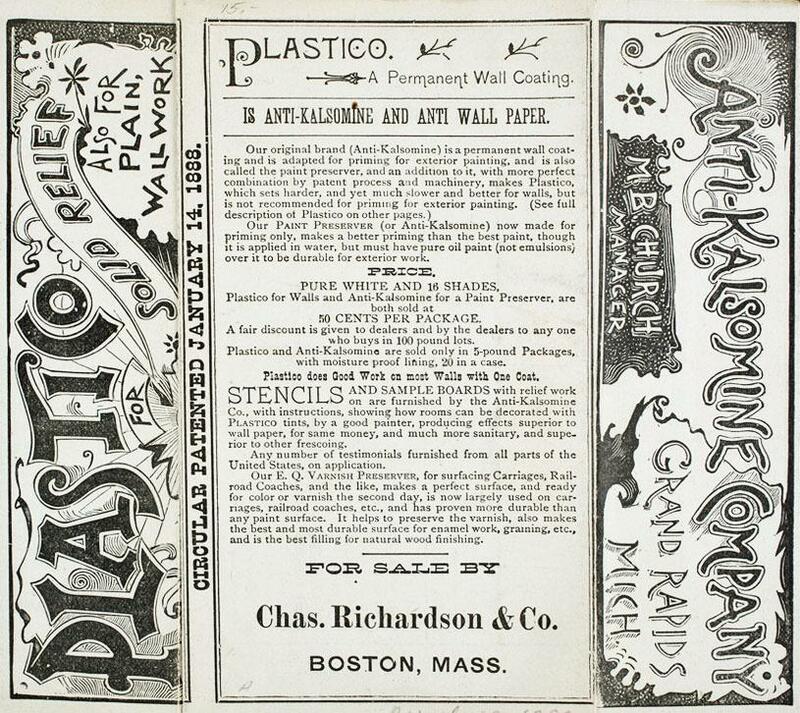 The circular was patented January 14, 1888, and the Charles Richardson & Co. is advertising the product for sale in his Boston store. From Albert Baxter's History of the City of Grand Rapids, "The Alabastine Company was organized in New York in 1879 by Melvin B. Church, its present manager. Alabastine is an article of which calcined gypsum is the base, made to take the place of calcimine in wall coatings and finish." The 1891 City Directory lists Melvin B. Church as General Manager of the Anti-Kalsomine Co. and Church Plastico Co. & Stock Farm. The Alabastine Co. manufactures alabastine (gypsum), land plaster, and Church's Potato Bug Poison. In the 1895 City Directory Melvin B. Church is President of the Alabastine Co. and General Manager of the Anti-Kalsomine Co. The Alabastine Mills were on the north side of Grandville Ave., west of the toll gate; until recently the Alabastine mines were open for tours.